When I first started blogging, I posted every day…YIKES! What was I thinking! Menu Monday (a child-friendly recipe), Timeless Tuesday (several quotations), What’s in Your Child’s Bookcase Wednesday (picture book review), Healthy Habit Thursday (health tip related to children), Follow Me Friday (school or library visits), Saturday Reflections and Cinema Sunday (kid-flick review). Lately, I’ve been focusing on my writing for children, so I’ve cut down on my blogging…usually only posting once a week. But today is my FOURTH day in a row of posting!!!! And what a special post this is! Recently, my dear friend, picture book author Clarike Bowman-Jahn, tagged me in an author-illustrator writing process blog hop and, since I am knee-deep in revisions and up-to-my-neck in story ideas, it seemed like the perfect time to participate. 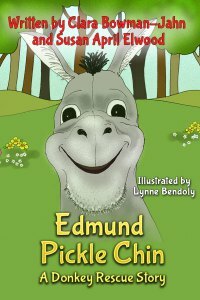 By the way, Clarike’s NEWEST picture book, Edmund Pickle Chin – A Donkey Rescue Story (co-authored by Susan April Elwood and illustrated by Lynne Bendoly) is HOT OFF THE PRESS. Click here to check out the ebook version. I’ll be reviewing it as part of her book blog tour. Clarike has also undertaken a huge memoir project. Her blog provides all kinds of wonderful resources and links for writers. Why not stop by and say hello. The hop has four questions…so hold on to your hats…here are my answers! I almost feel guilty calling this work. I’m having so much fun and I get so much joy from writing – It does not feel like work. I’m part of the 12×12 Picture Book Challenge…this encourages me to stay on task and write at least one picture book draft every month…I’m working on that draft right now. I also participate in two critique groups where I submit a manuscript each month for critique and then I get to critique the stories of my critique buddies…that means NINE critiques I need to do…plus this month, I’m participating in Angie Karcher’s RhyPiBoMo and I’m in a critique group for that…so an additional two critiques each week. I am learning so much from critiquing someone else’s manuscript AND reading the critiques that the others do. I’m currently polishing one picture book manuscript to resubmit to a small niche publisher…polishing another to submit to a small publisher who I met through Tara Lazar’s PiBoIdMo…polishing a rhyming picture book to submit as an entry into the Golden Quill RhyPiBoMo poetry contest. I’ll bet you can see the sparkle from all of that polishing. I’m also planning to try my hand at a picture book about dinosaurs (yes, I know, there are 10,000 of them already) and one about the All-American Girl’s Baseball League of the 40’s and 50’s. Sometimes I don’t feel my work does differ…in fact, sometimes, I pick up a book, turn the pages, and say – OH NO! THAT WAS MY IDEA! Has that ever happened to you? But I do know that all of my writing for children contains a core of positivity – my background in early childhood education and my own positive outlook on life lead me to do that. I am trying to learn to add humor because I know that kids love a funny book…and if they don’t love it, they won’t read it! I’ve always loved books. I know how important a book can be…one book CAN make a difference in a child’s life. I hope that my books will bring a smile to a child’s face and help a child approach life with a positive attitude. I’m a pantser, not a plotter. I get an idea – hear a phrase – see something interesting – and I want to write about it. So I sit down and write. And then I look it over and cross out a lot and write some more. When I am pretty happy with what I’ve written, I go over it for spelling and grammar and then I submit it to my critique groups. I take their feedback and suggestions and revise. And then begin again. Look over – cross out – write some more. Submit to critique groups. When I feel it is ready, I submit it – but that hasn’t happened as much as I had hoped this year – I plan to improve that for the second half of 2014. I think this is a perfect time to speak a bit about studying the craft of writing. I know we’ve all met people (some of them writers) who think that writing for children is as easy as 1,2,3. And most believe that writing a picture book is a piece of cake. Well, take it from me…if it is a piece of cake, it is a piece of the most complex layer cake you have ever eaten! The spark or idea is just the tip of the iceberg…there are so many elements (character, plot, structure, strong beginning, satisfying ending, etc.) that go into writing a great story…and once that is written, you are only just starting the process. Many revisions later, it is time to let other eyes look at it. Then, based on the feedback, more revisions. You can learn a lot about writing for children from books…there are many excellent ones out there…Ann Whitford Paul’s is my favorite. Attending conferences is another layer that can help…the workshops and presentations will teach you so much. But there is something else that can add so much to your understanding of the whole process – taking a class. And with everyone’s busy schedules, the online courses that are offered are perfect! 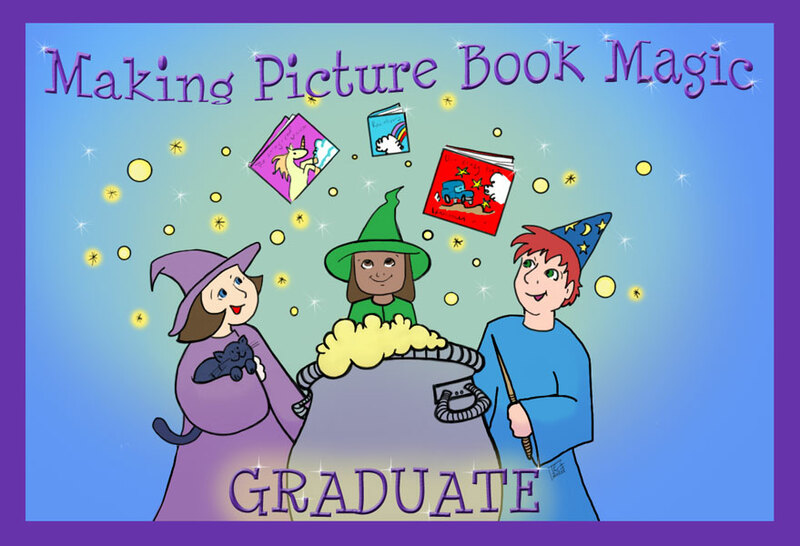 In February, I attended Susanna Leonard Hill’s Making Picture Book Magic class. I only wish I had taken it last year when she first offered it. One of the greatest joys of being part of this writing community is connecting with other like-minded souls. It is now my pleasure to introduce to you FOUR amazing women who are also passionate about their writing. Cathi is a gifted artist and illustrator who wrote an amazing book about kites which I reviewed last year…Ellen is one of my RhyPiBoMo critique buddies…and she introduced me to Monica and Artemis…see how this amazing spider web works. Originally from Colorado, Cathi currently lives and works in Madison, Connecticut where she owns a Creative Design Services Studio: C & D Studios. She is a working artist, illustrator, photographer, publisher and designer and, although the projects, subjects and work objectives have changed over time, the passions, artistry and skills have sharpened with new experiences, resources and challenges. She finds herself drawn towards designing for the web where she likes to empower clients with emerging resources. Cathi is also a member of the SCBWI Society of Children’s Book Writers and Illustrators and the NESCBWI New England Connections SCBWI. 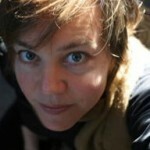 Her photography and photojournalism work has been recognized by The Connecticut Chapter of the Society of Professional Journalists’ annual excellence in journalism awards 2008 for published magazine covers and for photo-journalism stories. She handles web design, identity, branding, logos, photography and illustration for clients internationally and offers training, consultation and all kinds of design services for print and for the web. Cathi works with several Art galleries throughout New England as well. As an illustrator she is best known for her work illustrating College Mascots for the CBC Collection – officially licensed and approved Fine Art Illustration work for institutions and retail product lines. As a children’s writer, she is best known for her picture book, Be The Kite. 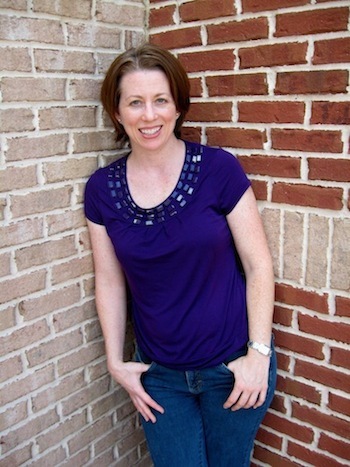 Ellen Leventhal is an educator and writer in the Houston, TX area. Ellen has a BA in Elementary Education and an M.Ed. in Special Education. She began her career as a special education teacher and currently works part time with students in second through eighth grade. Ellen’s writer’s dream came true when her first children’s book, Don’t Eat the Bluebonnets, was published in 2006. Hayfest, A Holiday Quest and Bully in the Barnyard soon followed. 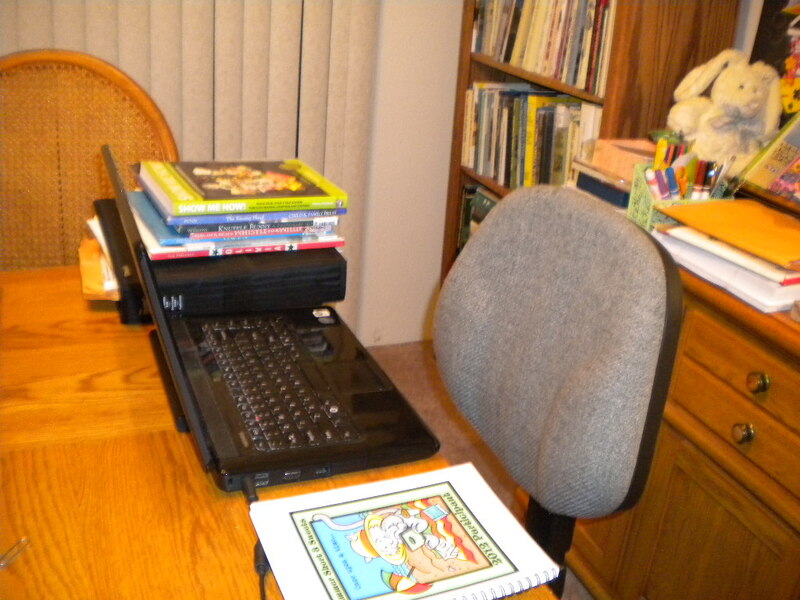 Now she is busy working on a middle grade chapter book, another picture book, and a compilation of essays. Ellen’s favorite part of her work is visiting schools and sharing her stories and passion for literacy. 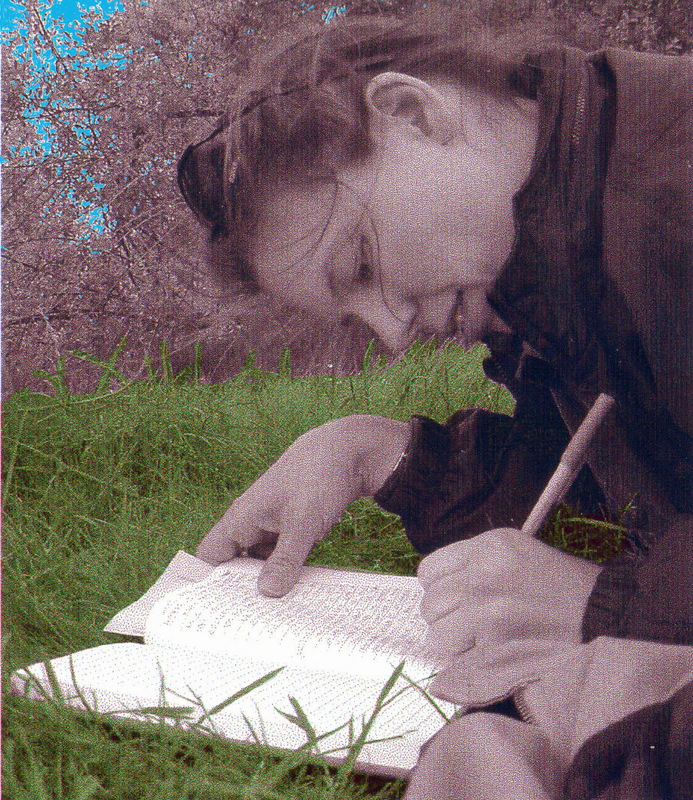 She loves working with and learning from other writers and the children she meets along the way. Monica Shaughnessy draws on her experience as a lifelong Texan by creating characters larger than the Lone Star State. Her works span multiple genres, including adult mystery/suspense, YA, middle grade, and picture book, but they all carry her signature offbeat style. If you’re looking for something outside the mainstream, you’ll find it in her work. When she’s not slaying adverbs and polishing prose, she’s either hanging out with her rescue dogs or stargazing in her backyard. Artemis Greenleaf has always been fascinated by the mysterious, and she devoured fairy tales, folk tales and ghost stories since before she could read. In 1995, she had a near-death experience which turned her perception of the world upside down. She lived to tell the tale (and often does, in one form or another), and went on to marry an alien. She lives in the suburban wilds of Houston, Texas with her husband, two children and assorted pets. She writes novels, short stories, and non-fiction. For more information, please visit artemisgreenleaf.com. I hope you all enjoyed meeting the four authors I tagged. I know they all plan to do author/illustrator writing process blog hop posts…I hope you will go and visit them to say hello…and perhaps some of you know them already! Now I’m off to work on my poetry submission for RhyPiBoMo…or maybe it’s time for some popcorn and a movie with hubby!